Our Skinny Cappuccino can be enjoyed just as much as our regular Cappuccino, but this time there’s no added sugar*. Still intense and with that dreamy froth you love, it’s also fat free and contains 50 calories a cup. You don’t need to go out to enjoy your favourite coffee in a skinny version, as your NESCAFÉ® Dolce Gusto® machine will create a barista-style drink from your Skinny Cappuccino coffee pods worthy of any coffee shop. Enjoy its smooth, milky texture and great-tasting roasted coffee time and time again, without compromising on the quality you expect. A brilliant coffee for little breaks and a real pick-me-up at any time of the day, enjoy this one in company or when relaxing solo. Make the most of its light colour and layer of velvet foam by serving in one of our beautifully designed latte glasses for an extra pop of style. 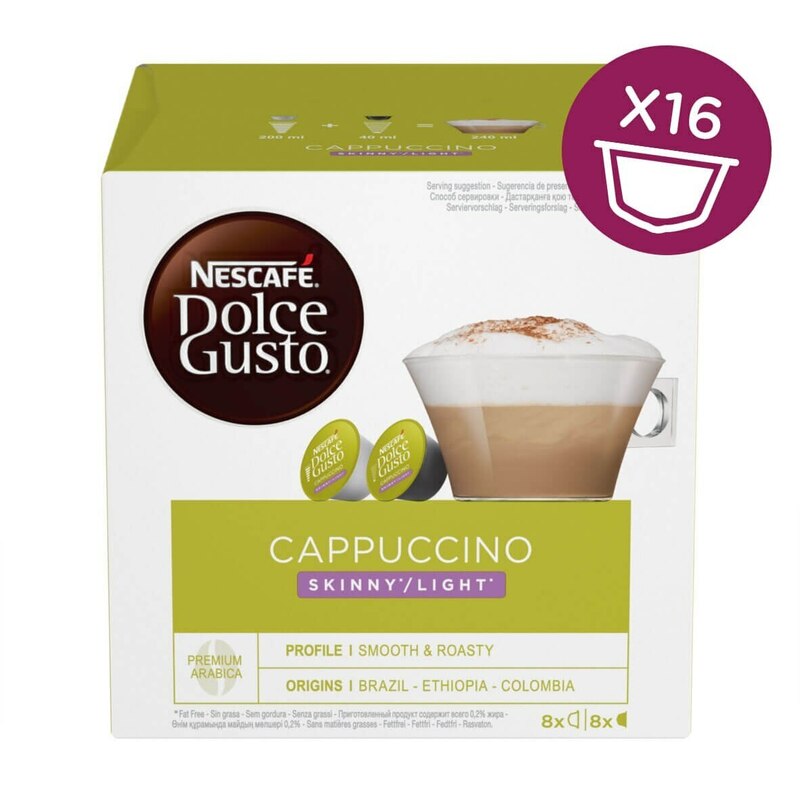 A lovely addition to any NESCAFÉ Dolce Gusto cappuccino capsule collection, this Skinny Cappuccino is a great one to have on hand for those days when you don’t fancy a regular cappuccino. 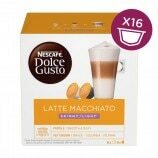 And if you love our Skinny Cappuccino pod coffee, you might enjoy our Skinny Latte Macchiato variety too! Skimmed Milk Powder, Emulsifier (Soya Lecithin). A mild,mellow,smooth,velvety,frothy cuppa,ideal for evening time not too strong,I do not take sugar,so I enjoyed this one. The taste of this is superb, as good as anything you pay for in a coffee shop. The fact this is low cal just makes me enjoy it even more. This is a great cappuccino, what you expect in shops. The coffee is great and is creamy. So light and very good for a nice start to the day. Great coffee love the taste and its only one pro point on Weight Watchers so that's good. Full of favour and creamy .well worth buying. Are you now more expensive than the supermarkets? This cappuccino is flavoursome and certainly hits the spot. Despite being the 'skinny' option, you get an intense coffee flavour. It's great that there is a skinny option available for those of us who want a treat without being too naughty. The value for money is great and you can have a coffee shop quality cappuccino for a fraction of the cost.